MailGuard has detected a new email-based cyber-attack using Telstra branding is hitting Australian inboxes. Interestingly, cybercriminals have gone a step further and impersonated another well-established company, DocuSign, within the same email. This is done in a bid to boost the legitimacy of the email and convince users to click on the links embedded within it. Using a display name of a Telstra Business Centre user via Docusign, the message actually comes from multiple compromised accounts. The message body advises the recipient that someone from Telstra has sent them a document to review and sign. 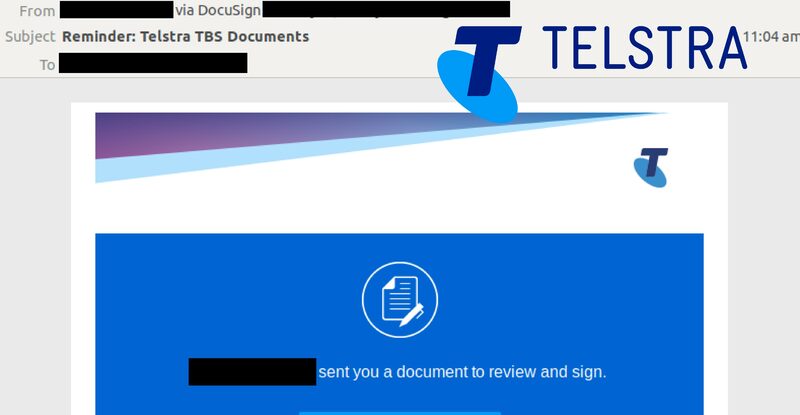 It claims that a user from a Telstra Business Centre branch is the sender of the document, with their name used in multiple locations including the message body. MailGuard understands that unsuspecting recipients who click on the link to ‘review document’ may initiate a malicious file download designed to infect the recipients’ computer. 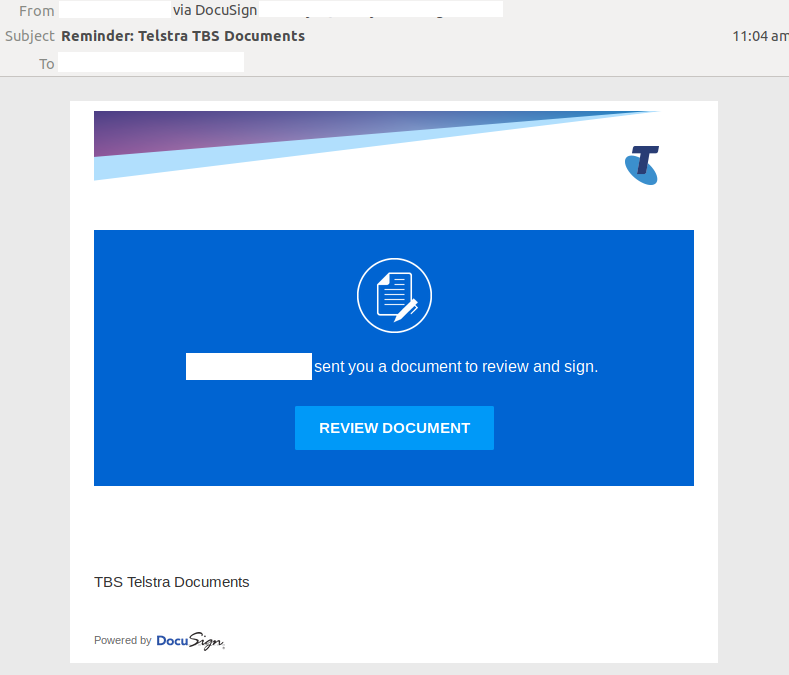 As mentioned above, the inclusion of both Telstra and DocuSign logos and branding within the email makes it harder for recipients to identify the email as a scam as it appears as a legitimate notification. In such cases, users are reminded of the importance of not accepting/clicking on documents from unknown senders, despite the organisation they purport to be from. All attachments/links should only be accessed when users are certain about the credibility of their owners. Telstra, by its large database and established brand credibility, is an ideal company to spoof by cybercriminals as it widens their victim pool. If your company’s email accounts aren’t protected, emails like the one above are almost certainly being received by your staff. Cybercriminals know people can be tricked; that’s why they send out millions of scam messages and put so much effort into making them look convincing. People are not machines; we're all capable of making bad judgement calls. Without email filtering protecting your business, it’s just a matter of time before someone in your organisation has a momentary lapse of judgement and clicks on the wrong thing. Keep up to date on the latest email scams by subscribing to MailGuard’s weekly update, or follow us on Twitter @MailGuard.